Seasonal flu, the regular influenza virus, has killed more than 13,000 people since the beginning of the year and swine flu has killed only one. Although you wouldn’t know it by the mass media hysteria surrounding this flu of swine. All of the news networks are tracking the “outbreak” by reporting the number of cases as they increase, which by the way, (insert sarcasm here) is REALLY exciting to watch 24 hours a day. Just yesterday a couple of people were reported to have swine flu in Marin and everyone in San Francisco started to panic as if Godzilla was swimming around The Bay ready to pounce on us Tokyo-style. Almost immediately after the Marin “outbreak,” The Governator declared a state of emergency in the best press conference ever by saying, “there is no need for alarm.” Well, isn’t that what “declaring an emergency” is all about!? You are sounding a freakin’ alarm so that people take notice, right!? Uh, really!? Let’s keep things in perspective people! You are no more likely to die from swine flu as you are from regular seasonal flu. The same rules apply. People should be a lot more worried about getting the AIDS virus, since that has a much higher mortality rate. But understandably it is a lot easier to get the swine flu virus than the AIDS virus. Use the same precautions that you would to avoid getting the flu and you will be fine. 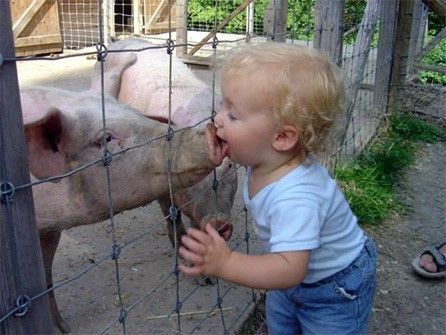 I am not saying we should all go out and start kissing pigs, but there is definitely no need to panic.